The ZyXEL VMG1312-B Series Wireless N VDSL2 4-port Gateway with USB supports Vectoring technology to eliminate crosstalk or interference among different VDSL lines. In the mechanism, Vectoring significantly increases bit rates to compete with cable/fiber technology as well as to enlarge service coverage without changing the current infrastructure â€” a way to significantly save cost comparing to fiber-to-the-home (FTTH) deployments, while the CAPEX can be optimized by improved data rates and coverage without upgrading equipment. 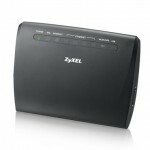 The ZyXEL VMG1312-B Series features 802.11n technology to provide an ultimate combination for both speed and coverage. With 802.11n wireless data rates of up to 300 Mbps, the VMG1312-B Series provides stable, reliable wireless connections for high-speed data and multimedia applications; the 802.11n technology also empowers the device to eliminate dead zones and extend coverage while retaining backward compatibility with any certified device. With the TR-069/TR-181 standard management specifications, the ZyXEL VMG1312-B10D allows service providers to manage and configure client devices remotely without interfering other end users. This unique feature not only offers true â€œplug-and-playâ€ experience, but also reduces deployment complexity and saves operating as well as maintenance costs for service providers. The ZyXEL VMG1312-B Series features optional 3G/4G connectivity as a failover (or alternative) connection to mobile broadband networks in case of DSL outage. Internet traffics will be temporarily routed through the 3G/4G dongle plugged into the USB port; all traffics will be switched back as soon as the regular broadband service becomes available again. It is also efficient to have instant Internet access in remote offices, activities outside of the office or occasions where DSL service is temporarily unavailable. For comprehensive dongle compatibility, users can simply check and download the respective patch file to enable mobile broadband services immediately without upgrading the entire firmware of the gateway.